Watching any episode or specific movie from When Calls the Heart always puts a smile on my face! It’s just good, inspiring television and that quite frankly is not very common among other channels or shows. For me, it’s so important to have shows like When Calls the Heart to watch alongside family but also because it speaks out to the television world about how shows with values and morals are still essential to have. 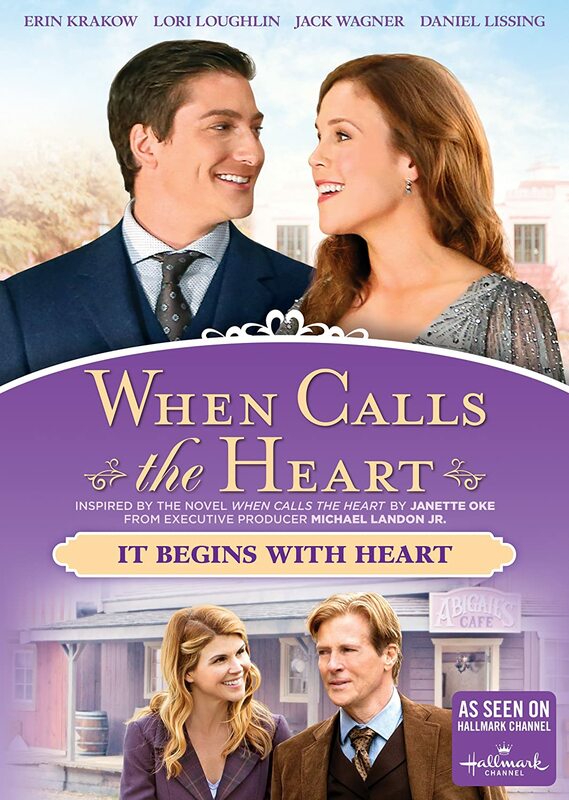 This specific movie When Calls the Heart: It Begins with Heart focuses on the days leading up to New Year’s Eve and how Hope Valley prepares as a new year approaches. The previous movie had shown how Elizabeth’s childhood friend, Charles Kensington had gone to Hope Valley and proposed to her. And to make matters worse, Mountie Jack Thornton with plans of proposing himself, saw everything. But by the ending, it leaves us not knowing what Elizabeth answer was. Now in this movie, we finally know her answer. It Begins with Heart starts with Jack chopping some wood nearby, probably trying to not thinking about what he just saw, Charles proposing to Elizabeth. 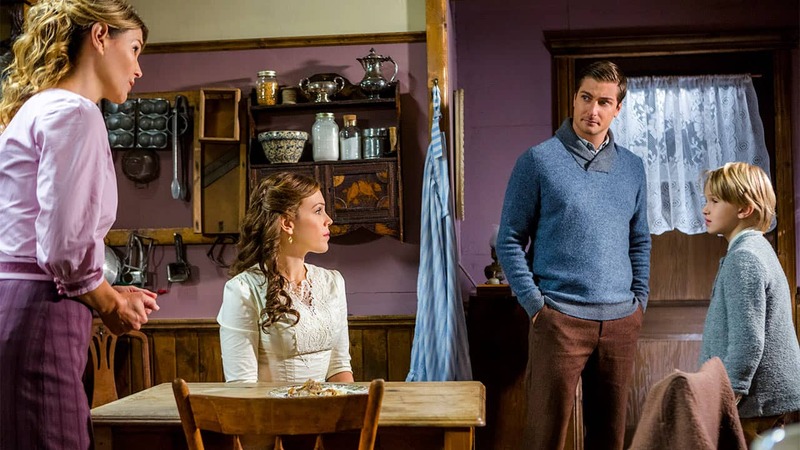 Now Elizabeth finds Jack but notices how coldly he is acting towards her. That’s when Elizabeth finds out that Jack heard everything but she quickly reassures him that she rejected Charles proposal. Even hearing this doesn’t convince Jack completely and instantly, us the audience is worried about the couple. Of course, Elizabeth visits Abigail’s Cafe to find some solace and advice from her dear friend. There Abigail notices that one of her fresh baked pies is gone so here begins a mystery. Back to Jack, he heads to the jail and Bill Avery is actually one of the prisoners because of his alleged involvement with counterfeit money. Bill wants to explain himself to Jack, to say his side of the story but all the evidence does make him look guilty. An inspector is set to arrive into town to take him to trial and there he would know what his fate would be. Since New Year’s Eve is very near, Rosemary takes on the job of planning the celebration. Of course, having Rosemary take on the job meant many ideas and over the top shenanigans. She is determined for it to be the best New Year’s Eve celebration also because a reporter from a very well-known newspaper was about to step foot in her little town and write a front-page article about how Hope Valley celebrated New Year’s. With the help of Lee Coulter and the rest of the town, her celebration had to be perfect. Regarding Bill, inspector Houston, who’s in charge of his case, arrives in town. Letting Jack know that a date for Bill’s trial has not been set and that he would have to testify since Jack had been the one to arrest him. Back in her classroom, Elizabeth is in the middle of class when one of her students mentions to her that an unknown boy is outside. Elizabeth goes outside to see who the mystery boy and notices a young boy stealing some firewood out back. I love how in this moment Elizabeth doesn’t become angry or says something to scare the boy off but introduces herself and offers some cookies. Not knowing what to do, the young boy drops the firewood and runs away. When approaching Jack about the boy and to see if he’s seen him before, Jack assumes he’s one of the kids from the new settler’s that have arrived recently in town. One night while Abigail and Elizabeth were in the cafe, they spot the unknown young boy stealing from the kitchen. Abigail approaches him, he’s scared but she offers him food. Right here is when Elizabeth realizes that it’s the same boy who had been in the schoolhouse. Both women sit him down and are made aware of that he has an older sister, Becky, who’s sick. They find her and both kids stay with Abigail during the meantime at least till Becky gets better. The reporter from the newspaper arrives into town and Rosemary is there to greet him but there’s a catch. He mentions Rosemary’s husband and even though she doesn’t have one she tells the man Lee is actually her husband and Lee continues the charade but not for long. Now, what happens with Bill? Is Jack & Elizabeth’s relationship okay? What will happen when the reporter knows Rosemary’s married? What will happen to Becky and her brother? This is all for you to find out in When Calls the Heart: It Begins with Heart. You can find this specific movie in the Fishflix store.